Production year slightly hampered by the effect of an air ingress in sector 12 during the winter technical stop (location 16L2). Nonetheless ~50 fb-1 delivered to ATLAS and CMS. 2016 was the first full year of exploitation of the LHC at a beam energy of 6.5 TeV. Proton-proton luminosity delivery to ATLAS and CMS was marked by peak luminosity well above design coupled with excellent availability. 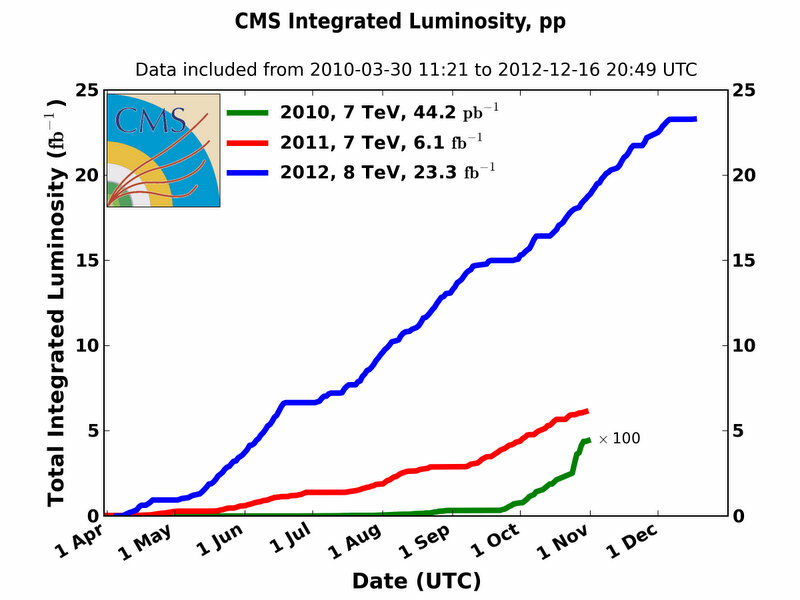 ALICE and LHCb also enjoyed sustained operation at their requested levelled luminosity values. The final 2016 totals of 40 fb-1 to ATLAS and CMS, 1.9 fb-1 to LHCb and 13.4 pb-1 to ALICE are impressive. They reflect the immense amount of effort that has gone into the preparation of beam in the injectors, the performance of accelerator systems, and the level of understanding and control that has been established to maximize overall performance while safely and relentlessly driving the beams through the complex operational cycle. The 2015 6.5 TeV proton run end on the 4th November after a challenging but interesting year. As of the end of October the LHC delivered luminosity in the order of 4.4e33 cm-2s-1 to ATLAS and CMS, 3e32 cm-2s-1 to LHCb and 5e30 cm-2s-1 to ALICE with around 4 fb-1 integrated for ATLAS and CMS. The first 6 weeks of 2013 were devoted to a proton-lead run. Four weeks of magnet tests led into long shutdown 1 (LS1). During LS1 there will be consolidation and upgrades of all major systems. One principal activity is the opening of all magnet interconnects, the measurement of the resistance of all splices in the cables that carry the current between the main dipole and quadrupole magnets, and the repair of any non-conformities.. There are around 10,000 splices in all. Recommissioning with beam is foreseen for the start of 2015. Re-commissioning with beam in 2012 started on 14th March. It took around 3 weeks to restablish collisions for the experiments. This was followed by a phased intensity increase to 1380 bunches per beam - progress outlined below. 5 fb-1 were delivered to Atlas and CMS by the weekend 9-10 June. We closed the books at the end of the first running period on Monday 18 June with: 6.6 fb-1 delivered to ATLAS; 6.8 fb-1 delivered to CMS; 0.65 fb-1 delivered to LHCb; and a little over 1 pb-1 delivered to ALICE. Given this data ATLAS and CMS were able to annouce the discovery of the Higgs boson on 4th July 2012. The 2012 proton run continued until December 2012. A total of 23 fb-1 were delivered to both ATLAS and CMS.